President Donald Trump's nominees for three very different positions at the Agriculture Department presented themselves to the Senate Agriculture Committee on Wednesday and were questioned on several controversial issues. The nominees are Scott Hutchins to be Agriculture undersecretary for research, education and economics; Naomi Earp to be assistant secretary for civil rights; and Mindy Brashears to be undersecretary for food safety. 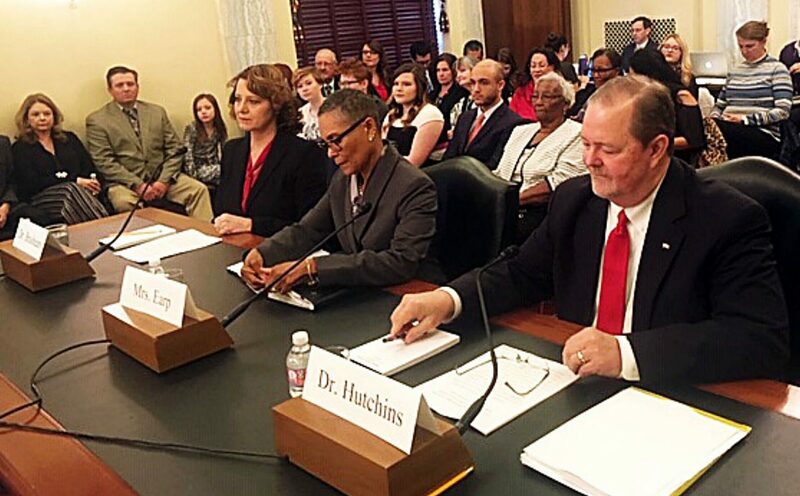 After Sen. Sherrod Brown, D-Ohio, asked Hutchins whether he accepts the scientific conclusion that climate change is human-caused, Hutchins said, "I accept the fact that climate change is occurring." "It's always occurred. To the degree that a large body of work exists that suggests humans are having an impact on the acceleration of that change in a particular direction … I accept that body of work." Brown told him he would have preferred that he had said more directly that he believes humans are causing climate change. Hutchins also said that he has "no reason to doubt" the recent climate change report's conclusions, but that the more important part of the report is "what we should do about it." Hutchins said he would emphasize what can be done to help farmers cope with climate change and that agriculture can play an important role in mitigating its effects. Asked whether he would stick to his beliefs "no matter what the president says," Hutchins said his views would be based on science but that he would emphasize that agriculture can tell a positive story about climate change. Asked by Senate Agriculture Committee ranking member Debbie Stabenow, D-Mich., and other senators about the Trump administration's plans to restructure the Economic Research Service and move most of the employees of ERS and the National Institute of Food and Agriculture outside the Washington metropolitan area, Hutchins said that he had not been briefed on the moves but that his goals would be to make sure that science "does not suffer," and that collaborations with agencies that remain in Washington continue. He also said of Agriculture Secretary Sonny Perdue, "the secretary's goals are the right goals … to be customer-focused." After Earp said that she would like to engage the Equal Employment Opportunity Commission to see if there could be a pilot or initative to expedite complaints of sexual harassment "in a way to separate sexual assault from the silliness that goes on as a part of harassment," Stabenow asked her if she considered harassment less serious. Earp said "I probably shouldn't have described sexual harassment as 'silliness,' although it is on acontinuum." Assault is a crime, she added, while harassment involves bullying and coarse language. But she added that harassment "chills the workplace, chills the environment." Earp said she would want to find out what has led to a culture of bullying in the Forest Service and figure out how to change it. She also said having a woman as Forest Service chief (Vicki Christiansen) "may give additional leverage in dealing with the problem," and that there are also lessons to be learned from military Tailhook incident and from what happened with women air traffic controllers. Earp said she is committed "to do whatever is possible with all the deliberate speed the government allows." Sen. Kirstin Gillibrand, D-N.Y., noted that Heidi Green, then the USDA chief of staff, had objected to 4-H's statement of support for LGBTQ youth, an issue that reached New York 4-H, and asked Earp if she believes that an assistant secretary for civil rights should weigh in on that issue. Earp said she was unfamiliar with the incident, but that it would be her professional legacy that every human being is entitled to be treated with civility and respect. Under questioning from Sen. Steve Daines, R-Mont., Brashears said that products that are produced in a lab should be differentiated from meat that comes from animals. "We are going to spend a lot of time to determine what this label should be," Brashears said, noting that she has worked on standards of identity in her career as an academic. She also told Sen. John Hoeven, R-N.D., that consumers have the right to know whether meat comes from an animal or from cell-based production. Brashears also promised to respond to consumer interest in locally produced meat by providing inspection services for small slaughter plants and mobile units. Acknowledging to Sen. Robert Casey, D-Pa., that a recent Food Safety and Inspection Service report found that plants are struggling to control salmonella on chicken parts, she said, "We have to get those numbers down." Brashears also promised Sen. Amy Klobuchar, D-Minn., that she would work closely with the Food and Drug Administration.